May 18, 2010 by Ken Ward Jr.
Hey f0lks, I’m back from the big EPA hearing on the Spruce Mine, and we’ve got a complete report posted on the Gazette’s Web site here. There’s more coverage from The Associated Press and The State Journal. I’m sure there will be more being posted tonight and early in the morning. And Coal Tattoo will have more to say about the hearing in the days to come … in the meantime, I welcome your thoughts … just please keep in clean and respectful. 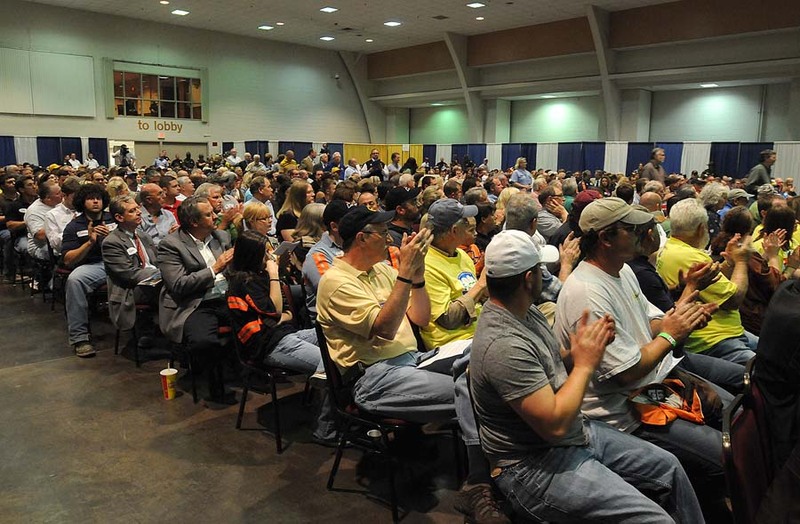 Those other 500 seats could have been filled with coal supporters if Cecil Roberts had not chose to bus members to Richmond to protest Massey Energy. I think this hearing was a more important event to support jobs, after all, the next big permit hearing could very well be for a UMWA job. The US Army had a recruiting phrase around ten years ago, ‘Army of One’. It really takes the dedication of one person to make a difference. There is a lot of death once these places are plowed under, and death should never be taken lightly. If you know the region you will understand the depth of James Weekley’s feelings from these vintage news stories. Songwriter John Denver had it right, W.Va is almost heaven. I hope it can be saved. Shelby says:March 27, 2010: Cousin Jim Weekley is in the honey business. Mr. Gardner, formerly at Arch Coal has since joined the practice of Jackson and Kelley in Charleston, W.Va. If we obeyed the Clean Air Act we might not have so much trouble with the Clean Air Act, and we might be a lot healthier as a result, reducing health care costs from diseases caused by pollution in the water and the air. The Clean Air Act gave the electric utilities 25 years or so to REPLACE their power plants with more efficient, less polluting ones. They ignored this and tried to skirt the law by tinkering and adding on pollution control devices to the old existing plants. This left us with old inefficient plants burning a lot more coal than necessary and producing odd results like exchanging sulfur dioxide with clouds of sulfuric acid. Our power plants now are probably only 30-40% efficient. If new plants were built to be 60-80% efficient (still really inefficient by any normal thinking, but better than the old ones) we could produce the same electricity with half as much coal. This means less mining and less air pollution with no inconvenience to the power using public. If we were to move at the consumer end with more conservation and add some wind and solar production, even less coal mining and burning would be needed. Am I crazy to think such thoughts? What am I missing here that keeps this from being a reasonable approach to the problem? I think that this is even what the old folks would call a “conservative” solution: smart thinking, less waste, and a little self denial for good moral character. The typical state of the art new plant is probably super-critical pulverized coal with an eff of 37-39%. Integrated combined cycle is much cleaner and has an eff of up to 44%, but there are only two in the US so far and not many of the proposed new plants are planning on this technology. Natural gas is, of course, much cleaner burning than coal and the plants are more efficient than the most efficient coal plant. They are also cheaper to build and can be cycled on and off, unlike a coal plant. I think the boom in natural gas discoveries will keep folks from building coal plants with, or without, constraints on carbon. All the more reason to keep forcing old coal plants to clean up their conventional pollution or shut down. Ken cited a study a few months ago on coal fuel cells. No combustion, but would still produce CO2 of course. A whopping 70% efficient. That would compete with gas w/ respect to carbon pollution, would out compete gas with respect to energy output to cost and is the kind of out-of-the-box thinking we need.